Choosing your next piece of Telemark Kit? It's difficult these days to make sure you make the right choice? With so few outlets selling a full range of telemark skiing equipment, and constant technolological innovation, it's hard to compare different gear. Personally, I love chatting to people on the hill, not only do I get to meet plenty of telemark skiers but I also get some interesting feedback. The problem with other people's opinions though, is that it's hard to gauge their level - are they the same level as you? Are they more or less powerful, heavy, skillfull? Do they need the same things that you do from their kit? Try telemark gear before you buy!? We're very proud to announce that from Autumn 2013, you can test NTN gear with us. 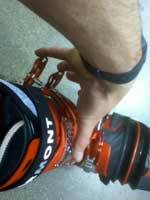 We have a stock of Scott NTN boots, mounted with Rottefella NTN Freeeride bindings and Scott skis. Come and test the latest NTN kit before you buy it. Check our stock of Scott NTN Test telemark equipment. However, if you don't have the chance to test new telemark gear, and if you're buying online, it's essential that you do your homework. We've put together some telemark equipment reviews to help you make an informed decision, we've teamed up with a group of passionate telemark skiers to review a range of telemark gear. We've also got some great buying tips to help you make the right choice.